I joined MUFON. The year was 1989... the place ... Manhattan. At the June meeting, I met some of the local researchers who I would 'encounter' off and on through the years ahead. Budd Hopkins was the guest speaker and brought with him an abductee who told her story. I also met a man named Michael Luckman, the director of the New York Center for Extraterrestrial Research and founder of the Cosmic Majority. We would run into each other from time to time through the years ahead, just as I would with Budd. The last time Michael and I met was in the 1990's. I was setting up a metaphysical event in Manhattan and he offered to help me promote it. Michael and I had a meeting while sitting outside a local pizza parlor in the Village. Michael is a great guy and really dedicated to his work. Like everyone else in the UFO field, he was compiling information for a book. At that same MUFON meeting, I also met Harold Egeln who I have mentioned before as a local Brooklyn UFO researchers, who I get together with from time to time. Actually, like myself, Harold has researched everything with a focus on time and the illlusion. His ET guide is ZM. Search Crystalinks for other 'Harold' references. 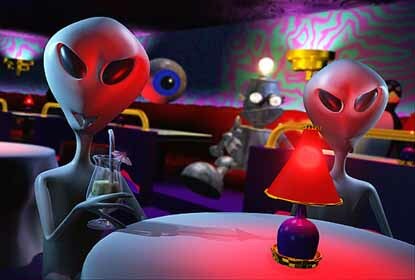 Shortly after we met ... Harold and I attended another UFO gathering run by Whitley Strieber. Alien Rock The Rock 'n' Roll Extraterrestrial Connection. The book is about musicians and their UFO/alien encounters. Poor A HREF="http://en.wikipedia.org/wiki/Bob_Geldof">Bob Geldof. His view that musicians can persuade politicians to end world poverty seems so shortsighted compared to Michael Luckman's belief, namely, that rock 'n' roll has an innate connection with extraterrestrials that can help heal the galaxy. Luckman's new book, Alien Rock attempts to find every, and any, connection between aliens and rock music. Presley: Aliens hovered over his home at birth, visited him many times, taught him how to move clouds and heal the sick, and even showed The King his future. John Lennon: Two close encounters with UFOs in the 1970s. Cat Stevens: More than just followed by a moonshadow. Sammy Hagar: Aliens "downloaded everything that was in my head'' as a teen. Ace Frehley: A UFO landed in his back yard. But was he wearing his KISS makeup? Luckman, director of New York Center for Extraterrestrial Research, does cite some well-known facts that shouldn't automatically get tossed down a black hole. Not that they make a strong case for an extraterrestrial rock 'n' roll connection. 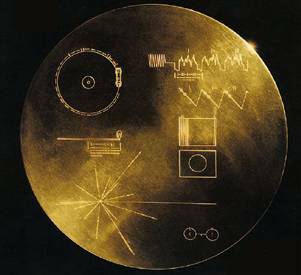 Yes, NASA has sent classical and contemporary tunes into space on satellites for any E.T.s out there to hear. And Lance Bass of 'N Sync made no secret of his hope to be an astronaut a few years ago. Alien Rock' is padded with all sorts of tangents that may be a little rock but not a lot alien. Musicians talk not only about their thoughts on UFOs, but also about their lyrical muses, ghost sightings and spirituality. Any mention of space, rockets or the cosmos in a song or album cover gets highlighted. And if the rocker came no closer to space than wearing a spacesuit in a music video or movie, well, hello Ziggy Stardust! Is this why I like oldies music and dated a few rock musicians in my day? Too far out for me, babe! Don't forget ... creation is harmonics, the tuning forks of time. All begins and ends with a tone, a soul note, calling forth the soul sparks.